Everyone likes to be healthy and in shape and we try in our own ways to achieve that elusive balance between eating our favorite food and watching the calories. My wife and I have many a times ordered a Salad at McDonalds or other fast food restaurants over a burger or a sandwich thinking we are making a healthy choice. Consumerist has thrown some new light on it and I was, to say the least, wasn’t delighted. Their findings suggest that some of these salads have not just higher calories than a burger or a sandwich, but also high in carbs!! An excerpt from the Consumerist article.. 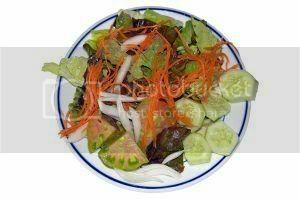 If calories aren’t your biggest concern, the salads also packed quite a hefty helping of sugar and carbs. Since they’re often marketed towards carb-conscious eaters, we were surprised to see the amount of sugar in some of these salads. Wendy’s Garden Sensations Mandarin Chicken Salad has more sugar, yes sugar, than 8 oz. of Coke. Well, now when we try to make a healthy choice we know what really is healthy. I know I’m giving up a little bit of my health just stepping into a fast food place but atleast I won’t have the false sense of making a healthy choice there. And I don’t have to sacrifice my favorite Grilled Stuft Burrito over a Fiesta Taco Salad which has more calories as well as more fat! Have you chosen a fast food salad over burgers thinking the same? How does this make you feel towards the fast food chains? Do you feel cheated? Wow, that is a little disturbing. I will often choose the salad over the burger in hopes of savings a few calories/carbs. You have to take any report like that with a grain of salt. If a writer doesn’t like fast food, the writer is more inclined to point out the bad things without pointing out the good things. Not only that, but they don’t tell you the whole story. Vegetables are notorious for having more carbs than meats. Grains as well. Potatoes and rice have more carbs than beef. Does it make them unhealthy? Not unless you eat too much. Sugar gets a bum rap — they make it sound bad to have sugar in your food. A lot of sauces use sugar or they wouldn’t taste very good at all. Sugar has 16 calories per teaspoon. That’s not a lot. I haven’t looked up the carb content, but it can’t be that much. Raw sugar, which you can find at supermarkets now, is equivalent to the sugar found in fresh fruit. Our bodies need sugar to rebuild our muscle tissue. I could go on, but I made my point. Look at the positive effect of eating salads at fast food joints as opposed to the negative things reported. How the food affects your digestion is probably more important than anything. I know Kyle. That’s what prompted me to write this. RT! Glad to see your comment here. Wow, very well said. Everything you have said about some misconceptions are something to think about. Great post, I just read the consumerist article. I do think that, it is a great thing that fast food restaurants are offering healthier choices though, even though they are not as healthy as a salad you would make at home, much better than a supersized Big Mac Meal. Americans are so pressed for time that often fast food is the only option for a short lunch break.